Kick 'em Jenny Volcano Map: Kick 'em Jenny volcano is located under the ocean's surface about five miles north of the island of Grenada in the Caribbean Sea. Mount Saint Catherine is the closest active volcano to Kick 'em Jenny and is located on the island of Grenada. What Is Kick 'em Jenny Volcano? Kick 'em Jenny is an active submarine volcano in the Grenadines island chain, about five miles north of the island of Grenada. It rises to a height of about 4,300 feet above the surrounding seafloor. Its summit is about 600 feet below sea level. Grenada Location Map: This map shows the location of Grenada in relation to the other islands in the Caribbean Sea. Activity at Kick 'em Jenny is difficult to observe because it is below the ocean's surface. The volcano was unknown until an eruption in 1939 produced a small ash cloud that rose to an elevation of about 900 feet above the ocean surface. During that eruption, people on the northern coast of Grenada were able to feel vibrations and see the ash cloud rise above the ocean in the distance. The eruption also produced a series of small tsunamis that were about six feet high when they arrived at beaches of Grenada and the southern Grenadines. The eruption was rated VEI 1 on the volcanic explosivity index. No injuries or damage were caused by the eruption or the tsunamis. However, it called attention to a previously unknown but active submarine volcano that has the ability to produce ash clouds, launch pyroclastic material, produce small tsunamis, and release large volumes of volcanic gas. T-phase waves travel through the ocean and can be produced by extruded lava reacting with the sea water, submarine landslides, shallow earthquakes, or a combination of these phenomena. Two episodes were definitely volcanic eruptions because they were accompanied by visible evidence at the ocean surface. These eruptions in 1974 and 1988 produced sea surface disturbances, discolored water, and small amounts of pyroclastic material. The remaining eleven episodes are known only from their instrument information. Kick 'em Jenny Plate Tectonics: Simplified plate tectonics cross-section showing how Kick 'em Jenny volcano is located above a subduction zone formed where the South America Plate descends beneath the Caribbean Plate. Magma produced from the melting South America Plate rises to form the submarine volcano. Kick 'em Jenny is located on the eastern margin of the Caribbean Plate. A collision between the Caribbean Plate and the South America Plate to its east, produces a subduction zone that has its surface expression as the Lesser Antilles Trench. The Caribbean Plate and the South America Plate are both moving in a southwesterly direction. However, the South America Plate is moving about 20 millimeters per year faster than the Caribbean Plate. This speed difference is what causes the South America Plate to subduct beneath the Caribbean Plate. This plate boundary is very active. Small earthquakes are common and trace the path of the descending South America Plate into the mantle and below the Caribbean Plate. As the South America plate descends into the mantle, it is heated and approaches the melting point of many minerals in the basaltic plate. This causes partial melting of the plate and ascending bodies of heated rock and magma. Some of these penetrate the overlying Caribbean Plate and cause the eruptions that form the Kick 'em Jenny Volcano. Similar collapse features have been found at several other volcanoes in the Lesser Antilles island arc. At other locations in the world, similar collapse features have been linked with regional tsunamis. Is Kick 'em Jenny Dangerous? Submarine volcanoes present a variety of hazards. They can erupt, produce eruption columns that rise high into the atmosphere, launch large rocks over broad areas, emit deadly gases, and produce submarine landslides that can trigger tsunamis. Submarine volcanoes are difficult and costly to monitor, and for that reason they are not as well understood as similar volcanoes that exist on land. Kick ‘em Jenny has only been known since 1939, so it does not have a long period of observation that would allow its eruption frequency and behavior to be understood. The primary danger of Kick ‘em Jenny is its unknown capabilities. Kick ‘em Jenny has the potential to produce explosions that send small ash clouds high into the atmosphere. The ash could be transported long distances by wind and present a hazard to aircraft flying near the volcano and downwind. With any sign of potential eruption, aircraft will be warned to stay away from the volcano. Explosions can also launch pyroclastic debris high into the air. Ejected materials large enough to kill people or damage watercraft could be thrown at least one mile or more from the volcano. Watercraft will be warned to stay away from the volcano if there are any signs of activity. One of the problems with providing adequate warning is that the volcano is below the ocean surface and not closely monitored. This justifies an investment in monitoring equipment. The 1939 explosive eruption of Kick ‘em Jenny "generated a series of sea waves which had amplitudes of about 2 meters in northern Grenada and the southern Grenadines". It is unlikely that the blast of an eruption will produce a major tsunami unless the volcano grows and its summit is at a shallower depth. The more likely tsunami threat is from submarine landslides. These tsunamis could be triggered by a dome collapse or a landslide on the flank of the volcano. Either of these events could displace enough water to produce a large wave. These types of events are known to have occurred at Kick ‘em Jenny through evidence obtained from sea floor mapping. However, information about any tsunami produced during these events is not available. The sea floor around the volcano shows evidence of historic landslides and debris flows with submarine runouts of several miles. Bathymetric surveys across a 32-year period between 1985 and 2017 indicate that the volcano has added about 7 million cubic meters of material through constructive volcanism. However, during that same time interval, about 35 million cubic meters were lost through submarine landslides. Instead of growing larger and towards the sea surface, the volcano lost about 28 million cubic meters to submarine landslides. The information above is another call for monitoring. Instruments could be installed on and around the volcano to detect vibrations or changes in shape or volume that might precede a collapse or landslide. These events rarely happen without some precursors. Submarine volcanoes have the ability to emit large amounts of gas into their surrounding waters. These gas emissions can happen suddenly, at any time, and are not always tied to a volcanic eruption. If the amount of gas is large enough, it can significantly reduce the density of the water. Ships on the surface will ride lower in these waters or even sink quickly when the gas-laden waters are encountered. This hazard is one of the reasons why ships are advised to steer clear of the area around Kick ‘em Jenny when any activity is detected. Volcanic gases can also be deadly. Hydrothermal Vents at Kick'em Jenny, an article on the University of Rhode Island's Kick'em Jenny Website, copyright 2003, accessed March 2018. 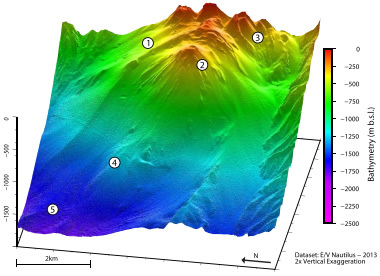 Thirty Years in the Life of an Active Submarine Volcano: A Time-Lapse Bathymetry Study of the Kick-‘em-Jenny Volcano, Lesser Antilles; by R. W. Allen, C. Berry, T. J. Henstock, J. S. Collier, F. J-Y Dondin, A. Rietbrock, et al; Geochemistry, Geophysics, Geosystems, Volume 19, February 2018. Kick ‘em Jenny History: article on The University of the West Indies Seismic Research Center Website, accessed March 2018. Kick ‘em Jenny Frequently Asked Questions: article on The University of the West Indies Seismic Research Center Website, accessed March 2018. 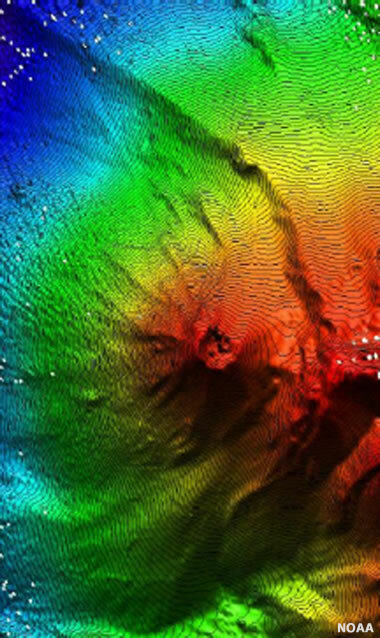 Morphology of the Kick'em Jenny Volcano: image published on the Ocean Explorer area of the NOAA Website, image data from 2002, accessed March 2018. Smithsonian Institution Global Volcanism Program: Kick 'em Jenny page. Eruptions by Kick 'em Jenny and historic volcanoes at this location have enabled Kick 'em Jenny to reach a height of about 4,300 feet above the surrounding sea floor. Future eruptions could build the volcano high enough to become an island. As the volcano grows closer to the surface, the danger from explosive eruptions and tsunami risk will rise. The volcano is on an active plate boundary and eruptions are expected to continue into the very distant future. In the article above, the value of increased monitoring was explained. Submarine volcanoes are poorly understood, and people, aircraft and ships are at risk in the area around this volcano. What is learned from increased monitoring at Kick 'em Jenny will transfer directly to submarine volcanoes in other parts of the world.